AirAsia Flight QZ-8501’s wreckage may have been found via sonar on the ocean floor off the coast of Borneo, reports on Wednesday said. Search and rescue crews, however, won’t be able to do much for the remainder of the day due to bad weather. 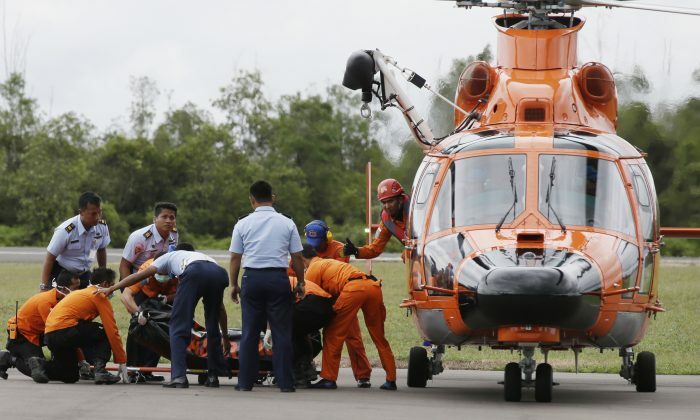 The head of the search and rescue agency in Surabaya, Hernanto, told Reuters they believed that the plane was found in waters between 160 and 165 feet deep. AirAsia Chief Executive Tony Fernandes added that nothing has been confirmed. The apparent wreckage was located on sonar near where bodies and debris were found. According to the news agency, the sonar image shows an upside down airplane. So far, seven bodies have been recovered from the water, including that of a woman wearing a flight attendant’s uniform. On Wednesday afternoon, AirAsia issued its latest statement, saying CEO Tony Fernandes met with the leaders of the search and rescue mission. “The search and rescue operations were unfortunately hampered by bad weather today but I am hopeful they will be able to resume the search tomorrow,” Fernandes said. Meanwhile, Indonesian authorities have disputed rumors that officials discovered that a victim of the plane crash was still alive. Conditions prevented divers from entering the choppy Java Sea, and helicopters were largely grounded. But 18 ships scoured the narrowed search area, and four of the seven corpses were recovered Wednesday before the search was called off for the day. Indonesia’s Meteorology and Geophysics Agency predicted conditions would worsen, with more intense rains, through Friday. The airliner’s disappearance halfway through the two-hour flight triggered an international search involving dozens of planes, ships and helicopters from numerous countries. It is still unclear what brought the plane down. Its last communication indicated the pilots were worried about bad weather. They sought permission to climb above threatening clouds but were denied because of heavy air traffic. Four minutes later, the jet disappeared from the radar without issuing a distress signal.